+ meteor crater and "Noah's Ark"
Mt Ararat is considered by Armenia to be their very own holy mountain – but today it's actually on the territory of Turkey (much to the annoyance of the Armenians). 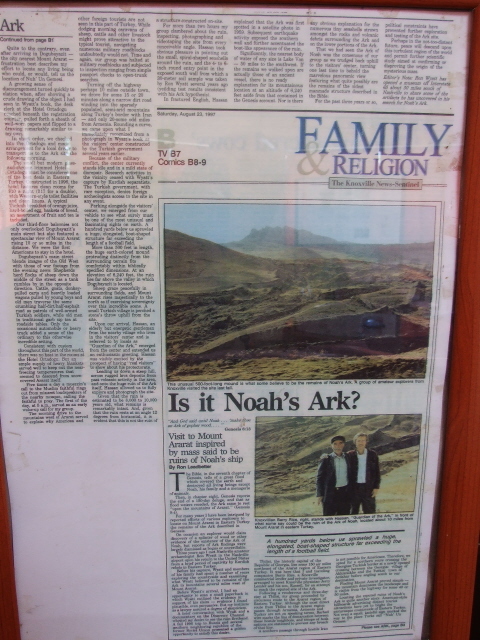 There's more holy-or-not-holy controversy: according to the Bible, Noah's Ark landed on Mt Ararat – and believers are adamant that they have indeed found traces of it here. Today there's even a visitor centre at the site. The exhibition inside tries hard to convince visitors through all manner of (pseudo-)scientific reasoning and "evidence", but less faith-guided people will find it all rather weird and bizarre. 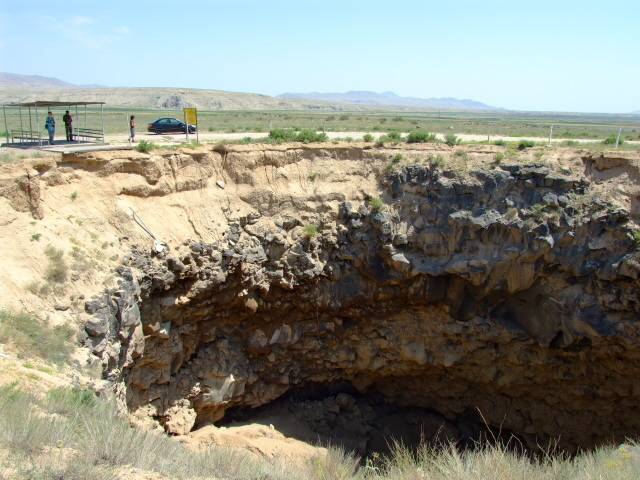 Right on the border between Turkey and Iran, there's another oddity: a huge hole in the ground which was (allegedly) created when a meteor hit in 1892. 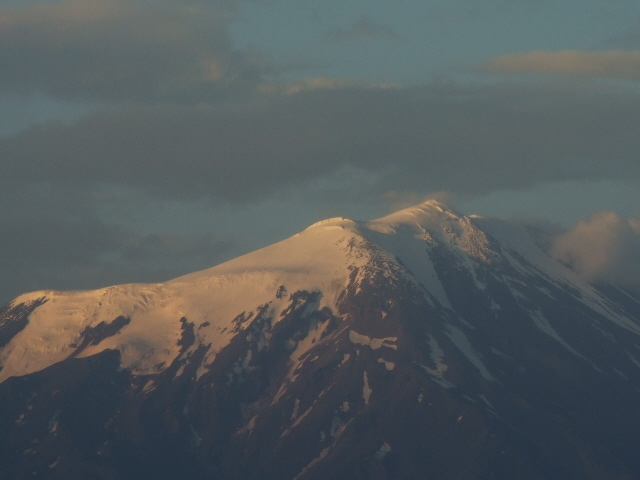 More background info: Mt Ararat ("Ağri Daği" in Turkish) is modern Turkey's highest mountain, at nearly 17,000 feet (5137 metres) it is also its only permanently snow-covered peak (as long as climate change doesn't put an end to that). It is a giant. Actually a dormant volcano, rising from the plain around it some 13,000 feet (almost 4000 m) … and it's also "big" in a biblical, archeological, natural-historical as well as a political sense. Politically, the mountain is a symbol of long-standing conflict. Not only because of the fact that Armenians claim the mountain as historically part their homeland. The two countries are at loggerheads anyway, especially because of the Armenian genocide at the hands of the Turks (which in Turkey is routinely denied) – see Armenian genocide monument. 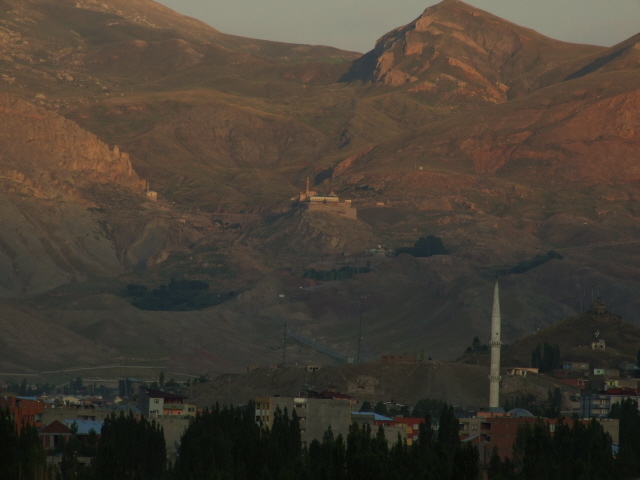 The mountain is also located in an area that is characterized by the long-standing conflict between the Turks and the Kurds. 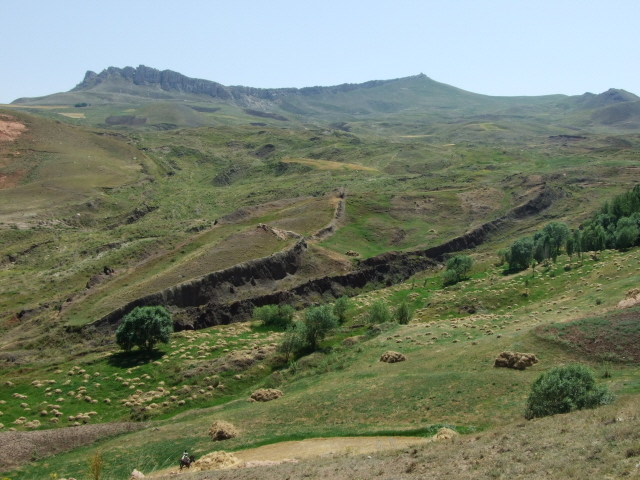 As recently as July 2008 some German tourists on a climbing trip to Ararat were kidnapped by Kurdish rebels … though they were soon released unharmed (in rather unclear circumstances). In addition, the southern flanks of the mountain form the border area of Turkey and Iran – the former a NATO ally, the latter a declared "enemy" of the USA. Not surprisingly, the military presence is high here. In 1892 the area was allegedly hit by a natural projectile that fell from the sky. 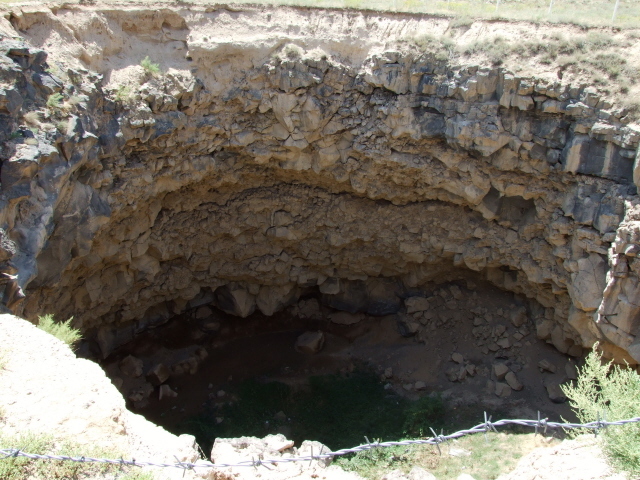 The "impact crater" almost directly on the Iranian border is said to be the result of a meteor that hit the rock of an old lava flow – it is thus not so much a "crater" but a deep hole in the ground. 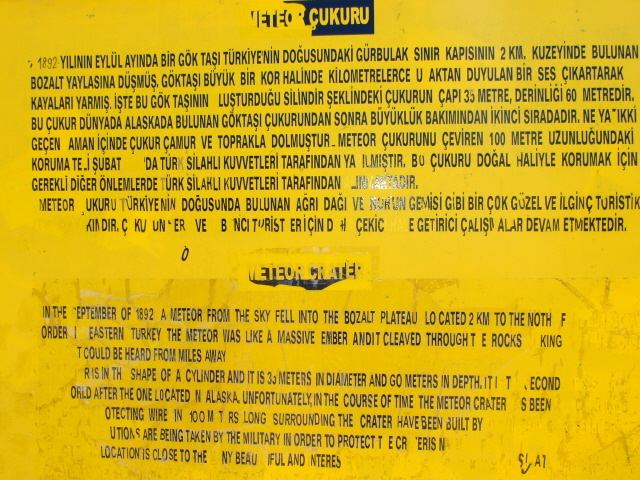 Various Turkish tourist brochures for the area claim that it is the world's "second largest" meteor crater after "the one in Alaska". I don't know what they mean by the latter – and I have the slight suspicion that they may have got it somehow confused with the Barringer meteor crater in Arizona, USA, which is indeed a lot bigger (though still far from being the biggest ever, it's only the best preserved such impact crater, thus retaining a real moon-like appearance). In biblical times Mt Ararat was allegedly "hit" by something altogether different: Noah's Ark is supposed to have hit dry land at the end of the biblical floods ('deluge') that killed everybody except Noah's family and the animals he saved from extinction, who subsequently repopulated the Earth. Believers of this biblical episode have repeatedly been claiming that certain formations of Mt Ararat itself were the remains of the Ark. But only in the 1950s and 60s did a find on a mountain slope opposite Mt Ararat really hit the headlines, because a rock formation was discovered that from the air looked uncannily like a ship, and it even had the right dimensions (ca. 550 feet long!) to correlate with figures given in the ancient scriptures. The story of Noah is also featured e.g. in the Koran, by the way, so the Turks are in no way opposed to the idea. Lots of "forensic evidence" was then collected to support the "theory". However, it only does if you already believe in it anyway. The big question that is not even addressed by any such "biblical archaeology" is: how is it supposed to be possible that a ship of such dimensions came to end up on a mountain slope over 6000 feet (2000m) above sea level? If the myth of the deluge is to be taken halfway literally at all, one scientific explanation that has been proposed is that the flood may have been caused by the breaking of the land bridge between today's Bosporus and a lower lying basin, i.e. 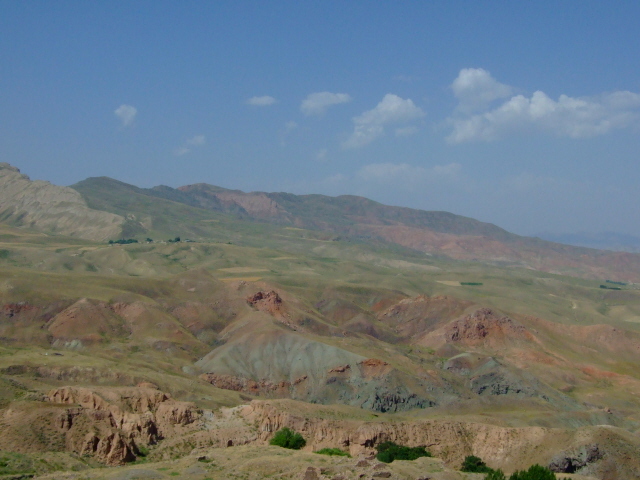 formerly lying below the oceanic sea level – like the Caspian Sea still today. This was then flooded until it covered the area within what today are the shores of the Black Sea. If this indeed happened it may well have been a catastrophic natural disaster, certainly for anyone who lived within the flood's reach. But it happened hundreds of miles away from Mt Ararat – and in any case, the waters could never have risen thousands of feet above sea level, they rather filled a below-sea-level depression (like the Dead Sea) to reach that sea level but never rose to more than that. So how is the Ark supposed to have got up to the height of this mountain slope then? Of course, those are not questions a believer in "biblical archaeology" (i.e. usually "creationists") would even ever ask. Instead it's evident that a lot of (esp. American) money was invested in an effort to give credibility to the story of the "archeologically genuine" Ark , in order to make it sound convincing. It seems to have succeeded with a corresponding clientele. But for the (rightfully) more sceptical visitor to the site the whole thing is rather a bizarre curiosity. And it's precisely that quirky entertainment value that really makes coming here worth it when travelling around in these parts. What there is to see: Mt Ararat is best viewed from the foot of the mountain – simply as a magnificent natural monument. If you so wish you can at the same time contemplate all the mythical or metaphysical aspects associated with Ararat. 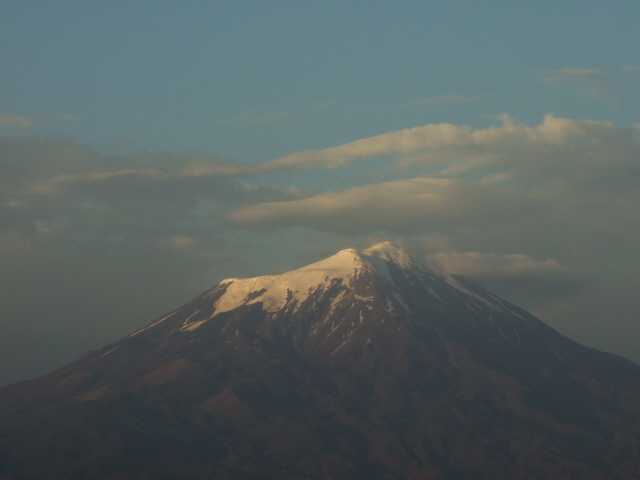 You can also quite physically climb Mt Ararat, which is supposed to be a fairly easy climb too (only altitude sickness can be a problem at elevations over 12,000 feet / 3500m). 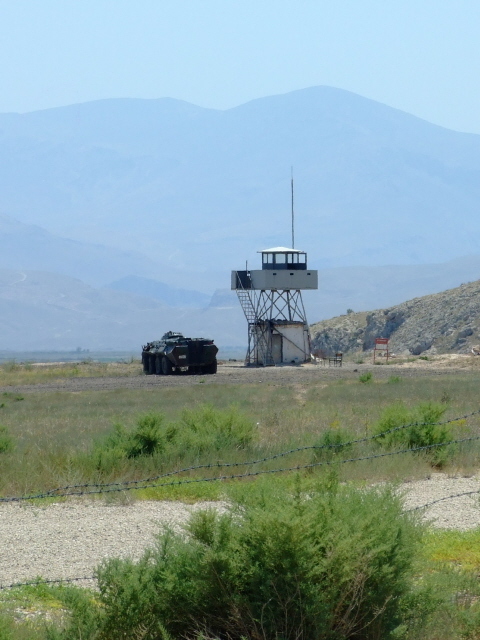 However, the uncertain security situation in the area may be something to take into account … given the persisting Kurdish conflict in these parts. In any case you need experienced guides and a special government permit, since the summit is part of the special military zone of the area. The former is really not so much a crater but a big hole in the ground, some 115 feet (35m) across and allegedly nearly 200 feet (60m) deep, though the bottom has silted up by at least a third. Except for this big hole in the dusty ground, there isn't really anything here – just a little roof structure to provide some shade, a small and empty, disused building (maybe it once had something to do with the site?) and a large yellow sign. The latter has, however, faded over time so much that it is barely legible any more. The Turkish text is in slightly better shape (useful only if you happen to know the language of course) but of the English about a third of the letters have come off, so you have to guess a lot to fill in the gaps … It is quite clear that the site is anything but well maintained. But this actually adds a certain extra exotic appeal to it! In the vicinity, there's lots of military, making clear what the priorities in these parts are … better do not draw attention to yourself. The other "oddity" of the area can be found in a somewhat less delicate location, high up a mountain side off the main road between Dogubayazit and the Iranian border: the alleged remains of Noah's Ark ("Nuh-un Gemisi" in Turkish). Next to the site where these "remains" were "located" there's a small round-ish bungalow that houses a kind of visitor centre. It's a surprising sight, like a touristic oasis, in the otherwise mostly empty, barren volcanic landscape. Before entering you can go round the building to take a look at the formations on the slope that are allegedly the remains of the Ark's hull. And yes, with a bit of imagination you can make out a shape that vaguely resembles that of a ship. The stickers on the door of the visitor centre already indicate that this is rather a pilgrimage site. It's even staffed – by an old man who apparently was also involved in the discovery of the "Ark" (referred to as the "guardian of the Ark" in some sources). Since the initial discovery of the site in 1959, several primarily American "bible archaeologists" have been coming to this place searching for clues that underpin the assumption it's really the Ark. The exhibits inside the centre comprise of various newspaper clippings (e.g. 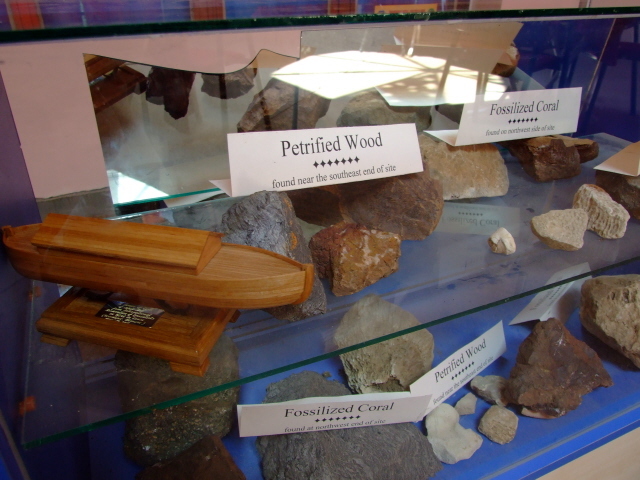 from "Family & Religion") and explanatory text panels about the "research", mostly in English, and all manner of "evidence" – including pieces of petrified wood allegedly from the Ark, ground penetrating radar scans of the excavation site, which show structures that supposedly are the keel and bulkheads, photos of alleged anchor stones, and such like. In addition it is pointed out that the size and location of the site correlate with historical sources (i.e. primarily the Bible) with baffling accuracy. Faced with all these finds and their explanations you almost find yourself beginning to fall for it – esp. falling into the conspiracy theory routine of taking a question as proof, namely: how else could all this have come to be here? Non-belief rightly regains the upper hand, though, once you take into account the rational explanations refuting the Bible archaeologists' "theory" (see e.g. Journal of Geoscience Education 44, 1996, 439-444). 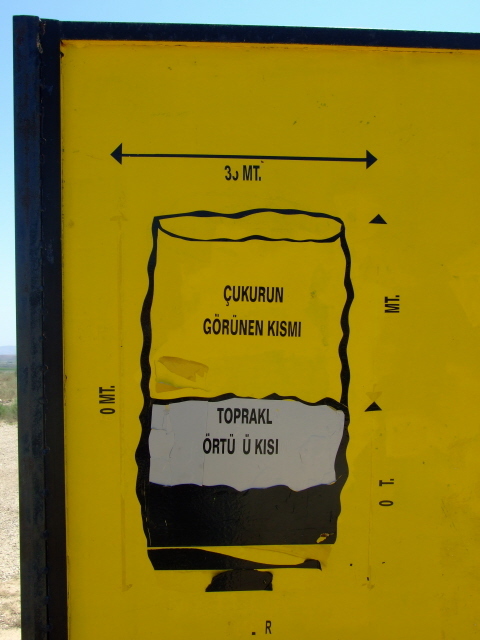 All in all, any trip to this outlying corner of Turkey is a bit of an adventure and thus not for everybody. But those with the relevant taste for such exoticness will find it extremely cool. You don't have to believe the stories about the meteor crater or Noah's Ark, it's still quite exhilarating to simply be here in this middle-of-nowhere location … with mighty Mt Ararat forming the backdrop. For me, it was one of the definite highlights of my journeys through Turkey. Location: in the far east of Turkey, near the borders with Iran to the east and Armenia to the north (and a bit of Azerbaijan in between). 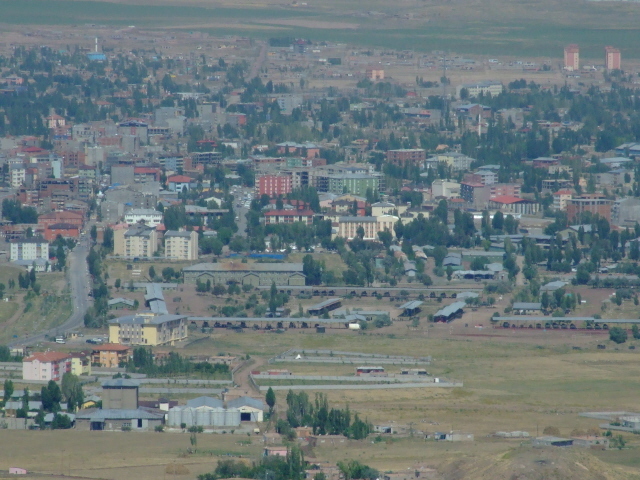 The border town of Dogubayazit is some 170 miles (275 km) south-east of Erzurum, ca. 125 miles (200 km) south of Kars (see Ani) and about 100 miles (160 km) north-east of Van. Access and costs: very remote, not at all easy to get to, it takes some effort and, accordingly, travel costs, but the sites themselves can be visited for free. Details: As an independent traveller you really need your own (hired) vehicle to get to these sites – or you need to find, negotiate and pay for taxi rides to the sites from Dogubayazit. The latter is the town that is the ideal (well, only realistically possible) base for exploring this remote corner of Turkey. To get here, the only alternative to your own vehicle is going by overland coach. The name of the town, Doğubayazıt in correct Turkish spelling, is pronounced "Doh-(y)ou-buy-ya-zit" (with level stress); the "g" is silent – so the name has nothing to do with "dogs" (although there are countless stray dogs in the town). Even much more so than Kars (see Ani) it has the feel of an outpost at the end of the known world … well, it is the last stop before Iran. Despite the remoteness, though, there are a few hotels. These include a couple of cheap places in town, and, a bit further out by the main road towards the border, a hotel/motel of the Sim'er chain. The fairly new (but already a bit crumbly) Golden Hill Hotel by the intersection of the main highways leading into Dogubayazit offers comparatively reasonably priced en-suite rooms with private balcony with a glorious view of Mt Ararat – a nice feature at sunset and esp. at sunrise! 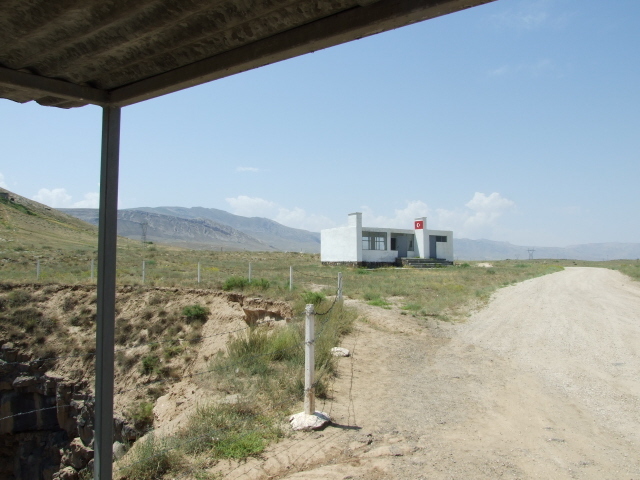 It's located right by the spot where the highway 975 leading north to Igdir (from where the 70 takes you onwards to Kars – see Ani) feeds into the main 100/E80 trunk road towards the Iranian border (and leading in the opposite direction all the way to Erzurum, 170 miles/275 km to the north-west). When driving in these parts you have to deal with military checkpoints, where you repeatedly have to show an ID, and may be asked to open the car boot for inspection. But as long as you co-operate (and don't carry anything stupid around), nothing worse than that can really happen. Much more nerve-racking are the general driving conditions out here – keep your eyes on the road at all times to spot regularly occurring deep potholes. Unpredictable lorries, speeding cars with suicidal drivers, or slow farm vehicles and animals on the road all are other hazards to be aware of. Navigation isn't always helped by road-signs – confusingly, sometimes tiny hamlets are signposted, while bigger places are ignored on signs. But then again, there are so few roads that it is generally not too difficult to find the correct turns, and roads have numbers. Mt Ararat can be seen from everywhere in and around Dogubayazit – although its summit is often shrouded in cloud. The town also serves as the starting point for Ararat climbing tours (when offered). The giant mountain is impossible to overlook, so it doesn't require any directions. The meteor crater is much trickier to find: it's right inside the army-guarded border area just a stone's throw from the Iranian border. To get there, first take the main 100/E80 road from Dogubayazit towards the border. It's a wide and comparatively well maintained dual carriageway trunk road – it takes the massive freight traffic into/out of Iran so even miles before the actual border crossing point you'll come to the end of a long queue of heavy goods vehicles waiting to be processed. In summer you can see the drivers sitting around on camping stools by their vehicles – it must take days for them to get through the border. To get past them, change into the carriageway for oncoming traffic – there's little traffic coming the other way, except for occasional military patrol vehicles. Just a few yards before you get to the actual border crossing point's buildings, a dusty dirt track branches off to the left. This is the start of the route to the crater. Roughly north of the main road. There are no detailed roadmaps of this area, but I took print-outs from GoogleEarth to try and find the right tracks; but it's easy to get lost in this dusty no-man's land. 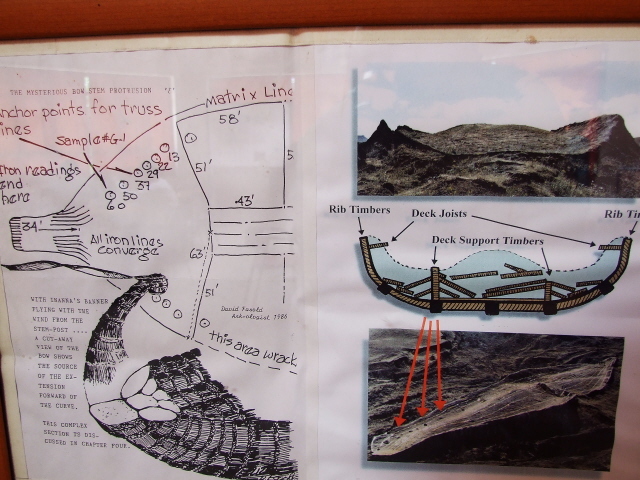 Military checks are getting predictably frequent here – and they can also help you navigate to the crater. While showing your passport ask "meh-te-or choong-koo-roo nereduh?" (with a light stress on the first syllable, otherwise level). The soldiers should then point you in the right direction. The road/track to "Noah's Ark" (signposted "Nuh-un Gemisi") branches off the 100/E80 trunk road from Dogubayazit to the right (south), roughly five miles (8 km ) before the border crossing point. It first leads past some military barracks then starts climbing up and up the mountainside on ever rougher roads. You have to carefully negotiate countless deep potholes and creep along in first gear. But eventually you come to an isolated low, round-ish white bungalow. This is the Noah's Ark visitor centre. The geological formation that is said to be the remains of the Ark is on the slope behind the centre. Time required: Seeing the meteor crater and "Noah's Ark" (plus visitor centre), including plenty of good views of Mt Ararat, doesn't take more than half a day, from Dogubayazit. But getting to this town takes time, so you'd have to plan for a stopover, which means an extra day getting there and another one for onward travel have to be factored in. this section already form a combination of sorts – further afield, Ani would make a another natural stop when travelling this far into the remote wild east of Turkey. 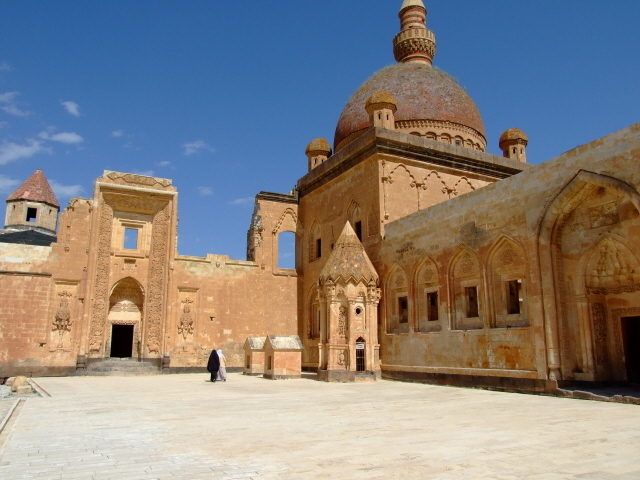 Ani can best be reached from Kars, which is about 125 miles (200 km) north of Dogubayazit (e.g. along highway 975 via Igdir and then on the 70). 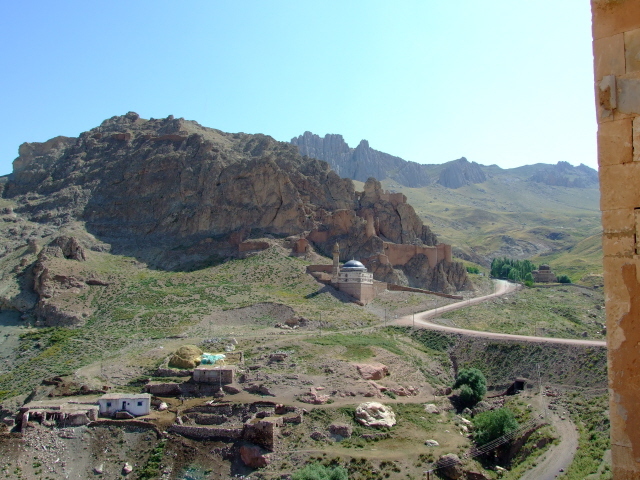 Combinations with non-dark destinations: just south of Dogubayazit the area's main architectural, historical site hugs a rocky outcrop high up in the red mountainside: Ishak Pasha Saray – once a lavish palace on the Silk Route, now empty but accessible. The intricate stone masonry is the main draw. 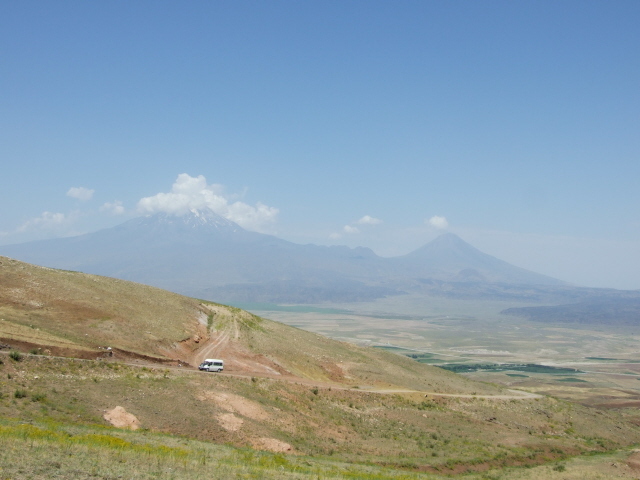 And the views – including Mt Ararat. For the tourist still looking for grimmer aspects, spot the massive military barracks with its rows of heavy tanks on the southern outskirts of Dogubayazit down on the plain. 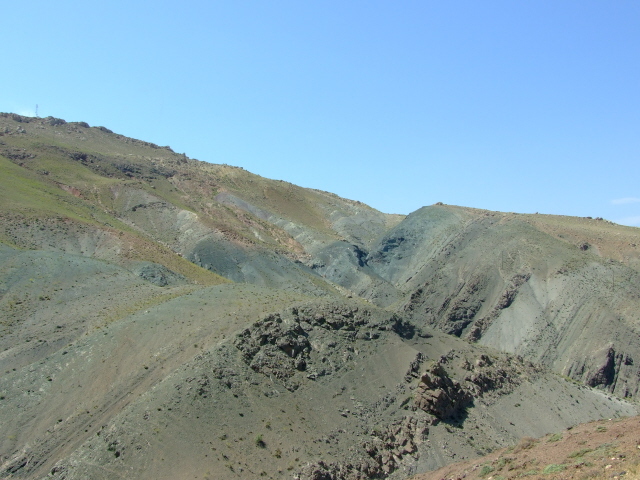 But just the view across the rocky, barren, colourful volcanic landscape is something to behold too. Further afield, the mysterious (and huge) Lake Van is a particular gem of eastern Anatolia too … also home of the mysterious Van cat – there's even a kitschy oversized monument to the breed. It's about 90 miles (145 km) south-west from Dogubayazit (but don't underestimate the road conditions!). For more see under Turkey in general.